One of the things of which I’m proudest as a blogger is that I’ve been able to build up some strong relationships with brands that I believe in, and in whose products we invest our own money in addition to working on their campaigns. Little Tikes is one of those brands – who didn’t have one of those fab red cars as a child, not to mention numerous other play equipment? It practically made my year when they sponsored me to attend the Britmums Live blogging conference last year and since then, they’ve invited us to participate in other events and campaigns as well. So when they invited the boys to join their #littletrikers campaign, swapping the stroller (or the TwinGo carrier, in our case) for two 4-in-1 Sports Edition Trikes, how could we say no? 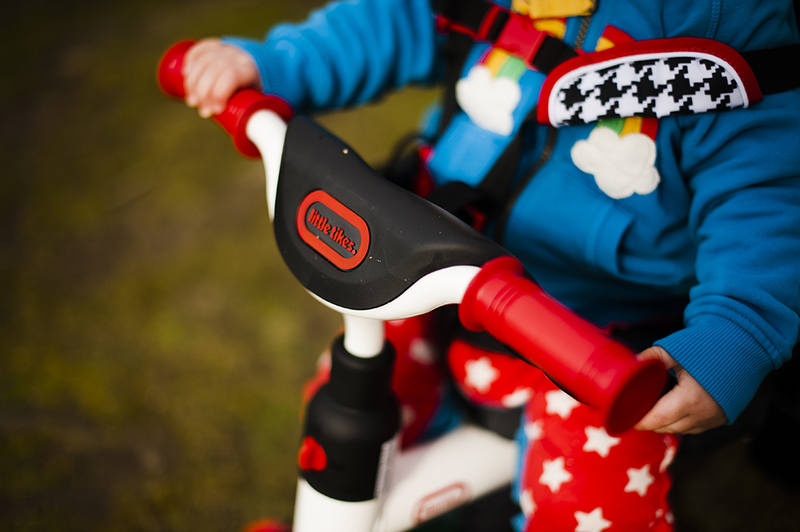 As with all of the Little Tikes products we knew that the new trikes would be durable and sturdy enough for heavy play – and, of course, great fun. We were loaned a GoPro and asked to make a little video of our adventure to share with Little Tikes. We live within about ten minutes’ walking distance from not one but two big ponds and yet the twins had never fed the ducks before – I think in part because I’m so rarely home, and Kirsty hadn’t wanted them to experience that first without me. 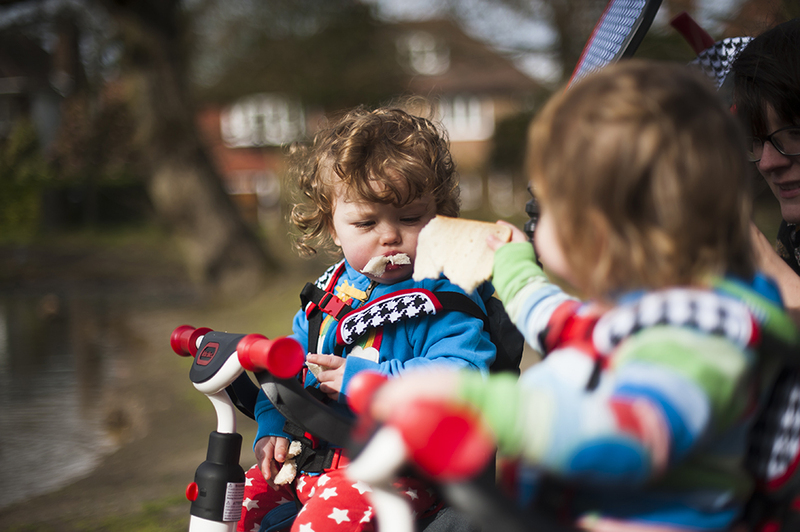 We thought it might be a fun place to visit with our tricycles and so, armed with half a loaf of bread, we loaded the twins up and ventured out into a beautiful bright day. I think the dog was a little horrified – she usually walks with the person who doesn’t have the pram unless both boys are being worn – but she soon realised that we weren’t going to run her over and conceded to walk sensibly. Naturally, we had to whip out the ‘big camera’ and take a few pictures as well. I think the boys actually ate more of the bread than the ducks did… whoops! The best thing about these tricycles, in my opinion, is that they really allow you to be ‘with’ your child in a way that you can’t with a buggy – I think because you can see them from all angles. It felt more fun and the twins found it hilarious when we made vroom-ing noises and ran with them, or zig-zagged across the path. They are quite easy to push, even on cobbled paths, and to get up and down the kerbs. I suppose the downside for us is that each trike really does require one adult to push – one of us couldn’t take two out. Still, they would be fantastic for a parent taking her toddler to pick up an older child from school, and they’re ideal for a park trip or just a jaunt out to break up the day. 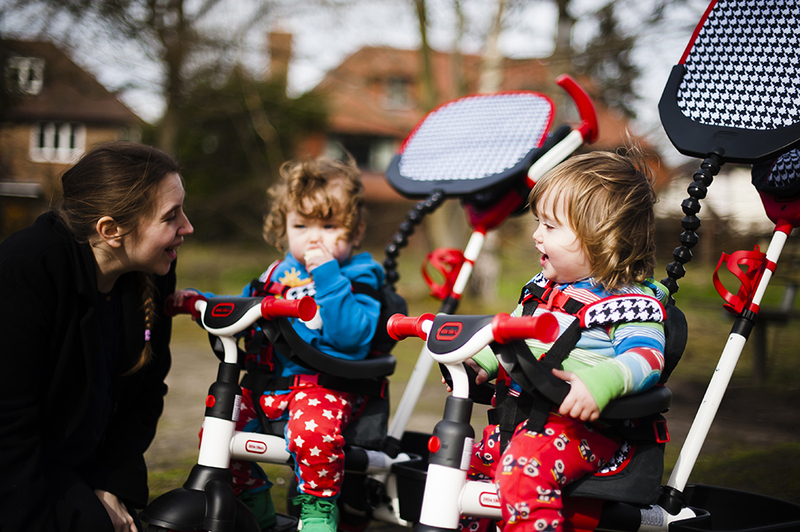 They’re not just a functional method of transportation either, we’re looking forward to taking off the handle and letting the twins loose with them in the garden once they’re big enough to understand how to pedal! You can see the video on my facebook page at the moment. It’s a lovely little record of a fab afternoon out, one that we’re certain to repeat in the near future. Big thanks to Little Tikes for inviting us to participate in this experience and for gifting us these strollers in exchange for filming our afternoon.